It's hard to believe that after our long, extremely hot summer it's already time to start planning and prepping for the colder seasons. However, nature and the changes in the garden are telling me that it's the time to start the process even though I still have an abundance of roses, dahlias, and other late bloomers. Gardening for me this time of year is a time to rejoice in the last of the beautiful summer flowering season and an introspective time to anticipate another year's bounty. One of my first fall tasks is to survey the garden to look for yellowing of leaves, fungal damage, and eggs that some of the pests may have left, a reminder that the circle continues. I'm also looking for signs that plants may need transplanting or separating. This could be decreased flowering, limited growth or that they simply aren't functioning as well as expected. Or perhaps my color scheme has changed or I want room to try new plants or varieties that are available. Before transplanting, I start by weeding the ongoing challenges of fireweed, shot weed and purslane, which I put in the garbage rather than the compost. I also hoe the garden to loosen the soil before the actual task of digging starts. Along with the weeds, the garbage bin gets any leaves damaged by fungus or diseased. Now the fun begins. I have come up with a plan of action and priorities, as age and creaky knees don't allow me to accomplish all the varied garden tasks at one time any longer. The benefit of this is that I get the opportunity to spend more time in the garden with multiple, shorter sessions. So, with knee pads, shovel, hoe, gloves, knife, and rake I start the process of preparing the garden for fall and winter. I start with my Astrantia - Ruby Wedding - as the seeds are exploding and leaves are dying back. I cut it back to within about 1 to 2 inches from the ground and rake the area clean since after I've completed all my tasks, I will mulch around the entire garden with 2 to 3 inches of G&B Organics Soil-Building Conditioner (similar to a compost). This will provide insulation as well as add nutrients to the soil to help boost the root systems as they combat winter rains. Next year I'll divide and transplant this plant as I notice it's grown substantially and the flowing is mainly on newer, outer growth, which means the center is not getting needed nutrients. This general procedure will continue throughout the garden for those deciduous plants that show signs they are ready for the transition. Many of the plants get the same treatment, including Echinops, dianthus, peony, coreopsis, and others. An exception to the above plan will be the calla lily, as it seems to enjoy the strength of soil conditioner to a greater degree so, after cutting it back, I will put soil conditioner directly on the plant. Note that this is the exception, as I've found putting mulch on plants has the potential of rotting or damaging next year's growth. The roses will be left blooming but I continually remove damaged leaves, which are few because of a routine of regular spraying of horticultural oil. I will prune the roses after the first frost and start spraying oil for winter maintenance. Also, I am pruning the lavenders back about 1/3 of the way to keep them compact and somewhat sculpted. This task can be done anytime after the second flush of Labor day flowering. Since they are evergreen, severe pruning can be detrimental to their health. The last plants to be cut back are the dahlias and deciduous grasses. I'll continue to let the dahlias flower until frost tells them it's time to quit so they will be one of the last plants to be cut back. 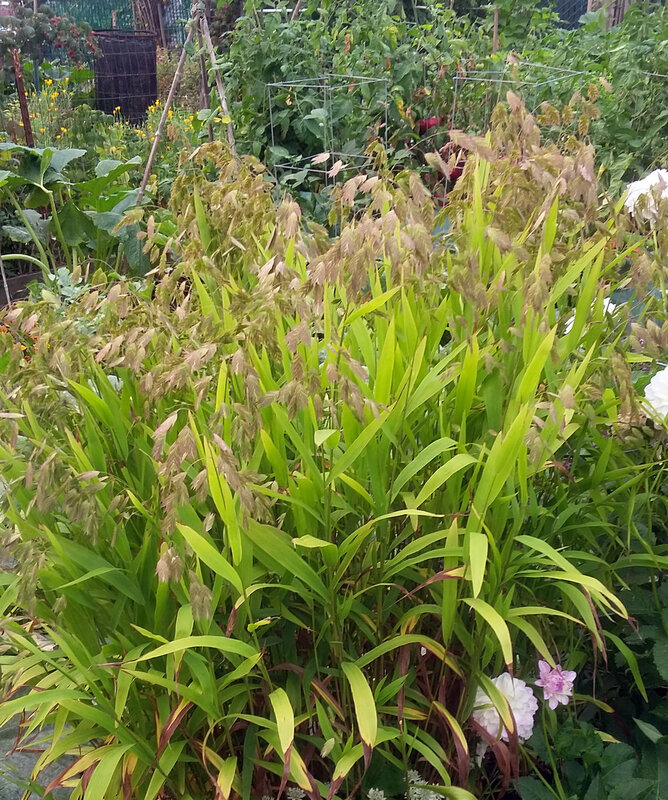 I like to leave my deciduous grasses alone because I enjoy the autumn beauty of the flower/seed heads, so they are the last plants in the garden to get my heavy hand. I'm also very careful in hoeing, digging or raking, as I have already seen signs of some of last year's bulbs showing immature growth just above the soil surface and I know there are many underground just anxiously awaiting spring. In summary, weed, deadhead, prune, separate, transplant, and mulch, and your plants will love you. If you have questions about specific plants, Swansons staff can provide you with great information about year-round garden care. Editor's note: Come by for in-person help or post your questions on Facebook, Twitter, and Instagram using the hashtag #heyswansons for quick, personalized advice!